You heard right! 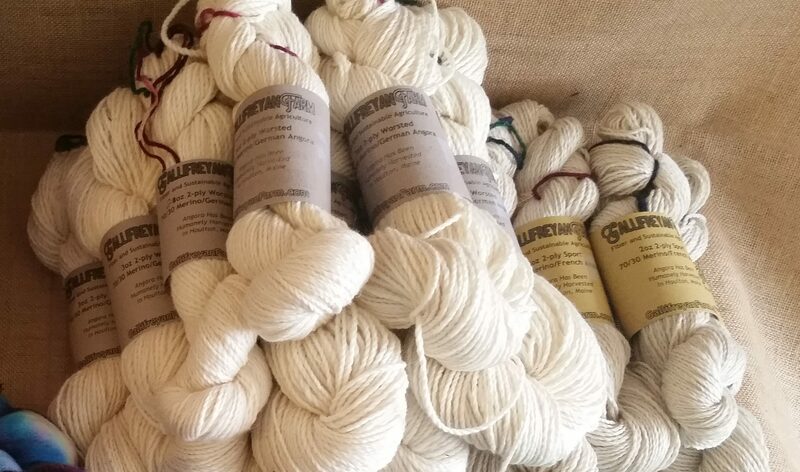 Gallifreyan Farm is so pleased and proud to be able to offer humanely harvested Angora blend yarns! Our yarn is milled locally in Aroostook County from our Angoras in Houlton with Merino that has been sourced from a New England-based wool company. We are super excited to have finally reached this point in our farm progression, and to be able to offer what we feel is some of the finest local yarn you’ll find. Quantities are currently quite limited, but don’t despair: our bunnies are growing fuzz as quickly as they can! We’ll get the skeins put into the online store in the next few days, but if you absolutely need a skein or two right now, please just shoot us an email: info@gallifreyanfarm.com. PS. All our yarn is currently undyed, however, that will be changing in the next couple of weeks as we experiment with some hand-dying methods… with dye that is made in Maine. P.P.S. Are you starting to see a trend here? Houlton. Aroostook. Maine. New England. We were quite serious about doing everything as locally as we can.